In the universe of hand-thrown pizzas, I’m the first to turn to the experts for that crispy-yet-chewy crust, perfect cheese blend and whatever magic they put on top. But that all changed recently, when I made my version of Ina Garten’s White Pizza with Arugula salad on top. 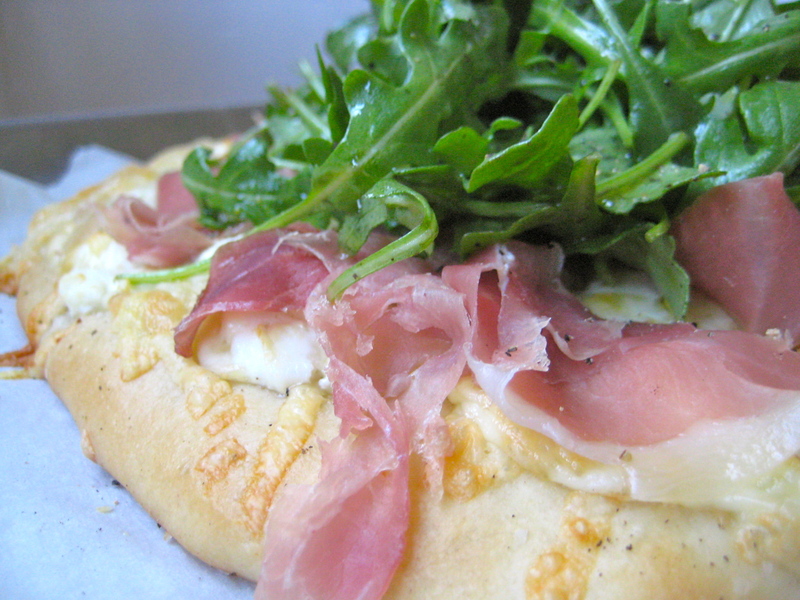 White pie with arugula is a popular pizza – the peppery arugula, tossed in a vinaigrette, adds a crisp bite to the ooey gooey cheese. My addition of thinly sliced prosciutto adds a veil of salty pork to the party that makes all the other ingredients have more fun. I made the dough the day before (veering from the recipe), which I think made it easier to work with. The garlic-chili-thyme oil is brilliant – be sure to spoon some of the soft garlic bits onto the pizza as you drizzle – they get all sweet and smooth. And the simple lemon vinaigrette for the arugula just brightens the greens. If I could marry a pizza, it would be this pizza. Grant said this is the best pizza he’s ever had. And he’s lived in NYC! 1 1/2 cups grated mozzarella cheese (7 ounces) – I forgot to get this, so just used leftover manchego – use up your leftover cheeses here! Mix the dough: Combine the water, yeast, honey and 3 tablespoons of olive oil in the bowl of an electric mixer fitted with a dough hook. When the yeast is dissolved and fizzing (10 min. ), add 3 cups of flour, then 2 teaspoons salt, and mix on medium-low speed. While mixing, add up to 1 more cup of flour, or just enough to make a soft dough. Knead the dough for about 10 minutes until smooth, sprinkling it with the flour as necessary to keep it from sticking to the bowl. When the dough is ready, turn it out onto a floured board and knead it by hand a dozen times. It should be smooth and elastic. Let it rise. Place the dough in a well-oiled bowl and turn it to cover it lightly with oil. Cover the bowl with plastic wrap and allow the dough to rise at room temperature for 30 minutes (or longer, if you go out). Meanwhile, place 1/2 cup of olive oil, the garlic, thyme and red pepper flakes in a small saucepan and bring to a simmer over low heat. Cook for 10 minutes, making sure the garlic doesn’t burn. Set aside. Dump the dough onto a board and divide it into equal portions (we made two, but you can make up to six). Place the doughs on sheet pans lined with parchment paper and cover them with a damp towel. Allow the dough to rest for 10 minutes. Use immediately, or refrigerate for up to 4 hours (Note: I instead just punched the risen dough down and left covered in the fridge overnight). Meanwhile, whisk together 1/2 cup of olive oil, the lemon juice, 1 teaspoon salt and 1/2 teaspoon pepper. Add the greens. 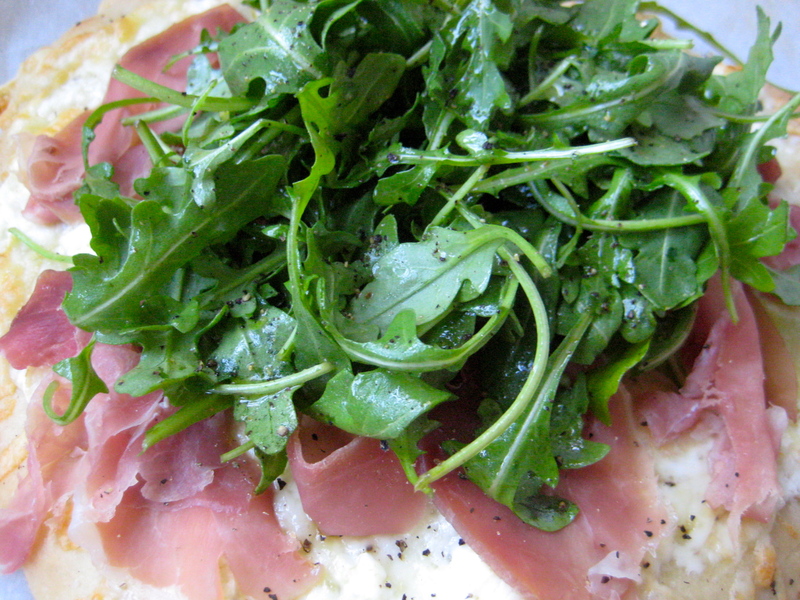 When the pizzas are done, place the arugula in a large bowl and toss with just enough lemon vinaigrette to moisten. 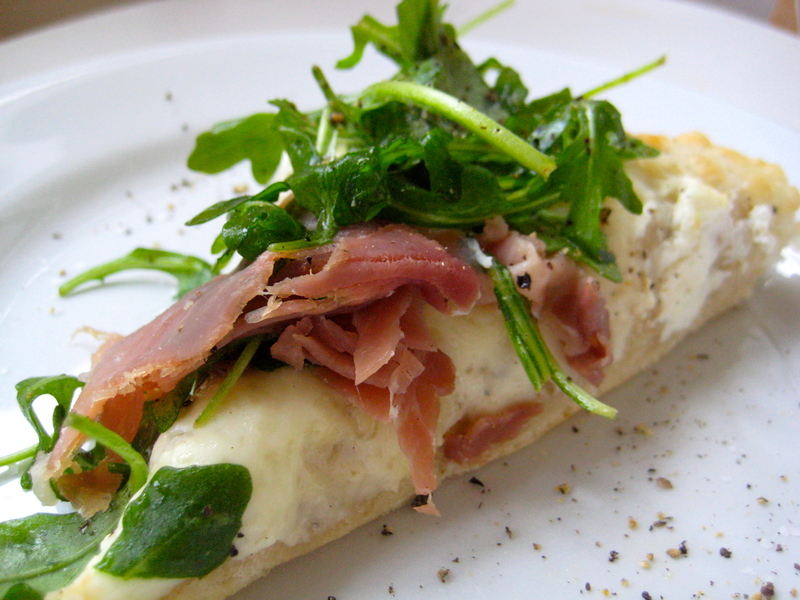 Place a large bunch of arugula on each pizza and serve immediately. When you slice in, the cheese will be delightfully messy, the prosciutto will be blooming with that slightly gamey flavor and the arugula will be starting to wilt. Yum. This entry was posted in Uncategorized and tagged arugula, Ina Garten, pizza, prosicutto, white pizza. Bookmark the permalink. i hate it when you make me drool at my desk. i don’t think i even LIKE white pizza.